“What’s for dinner?” That is the number one question asked when my boys are home. The second most asked question? “Have you seen my shoes/my phone/ my keys?” It can be hard coming up with interesting and delicious meals, day after day. I can remember my Mom saying “The cooking part is not hard, it’s coming up with the ideas and having all the ingredients that is so exhausting”. “I hear you, Mom!” I battle menu fatigue by keeping a pantry stocked with beans, grains and legumes and I try to have a lot of fresh produce around so I have more options without having to order takeout run out to the store with a long grocery list. I also try to keep my freezer stocked with flash frozen raw shrimp and scallops that thaw quickly. I often get dinner inspiration from wonderful produce I find at the farmer’s market, or if I’m lucky, right from my own garden. 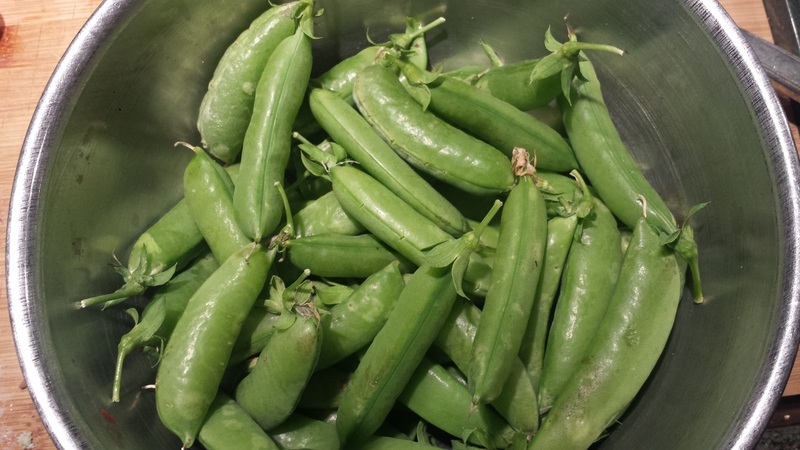 Yesterday, my late fall gardening efforts were rewarded with an abundance of juicy, fat sugar snap peas hanging off their vines. I harvested a giant bowl of them and started to think about the best way to showcase these emerald gems. 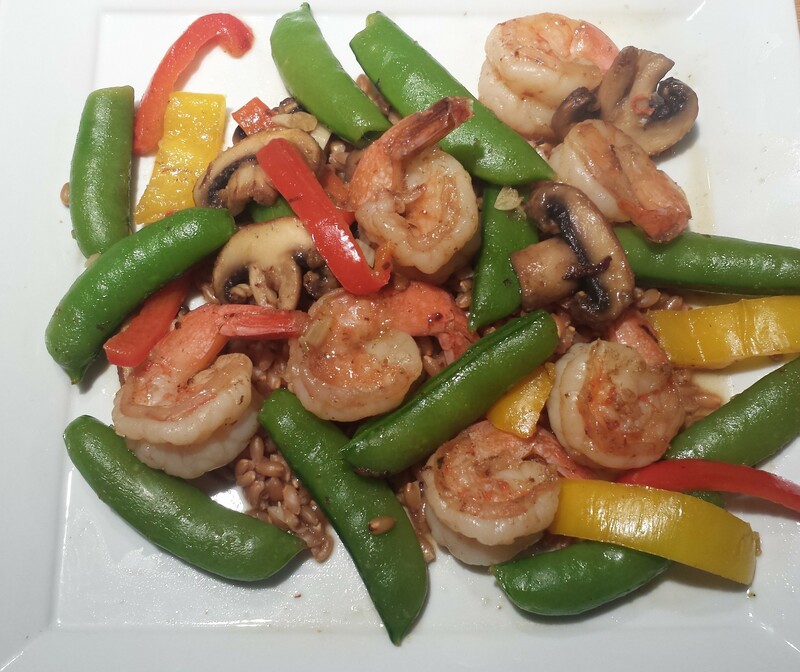 Their color is fabulous so I decided to pair them with colorful bell peppers, mushrooms and shrimp for a very spring-like meal. The beauty of this dish is that it is very simple, only a few really good ingredients, but delicious and pleasing to the eye. I never learned to properly stir-fry. I understand the concept of starting with the vegetables that need to cook the longest and ending with those that are fastest cooking. I just never really mastered the technique of pushing the cooked food up on the sides of the wok. I’m sure it was operator error but everything always ended up down in the bottom in a big jumble. I prefer to cook everything separately so I can more easily control the level of cooking, plus each vegetable maintains it’s distinct flavor and character. 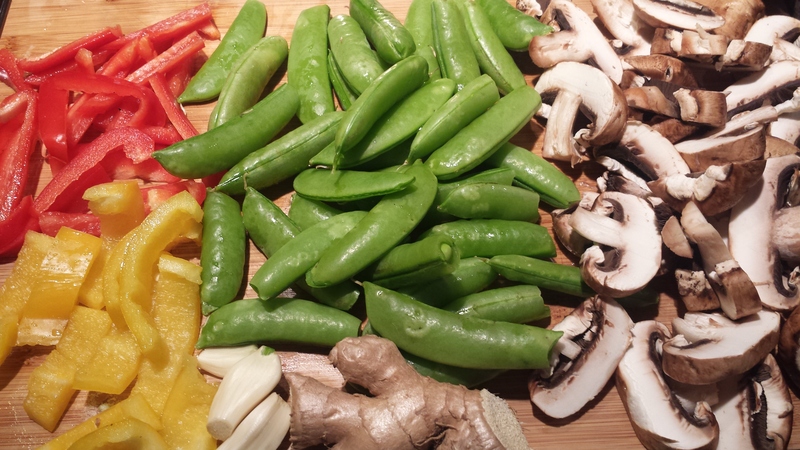 I cooked the snow peas and peppers first, then the mushrooms and lastly the shrimp. Then I threw all the vegetables back in the pot with the shrimp and tossed them together. I served it over brown rice, but any grain, or even pasta, is a great setting for this dish. A very simple way to add more flavor to rice, without resorting to heavy sauces, is to cook it with vegetable broth instead of water and toss in a one inch piece of fresh ginger, peeled but not chopped. Just remove the ginger before serving. 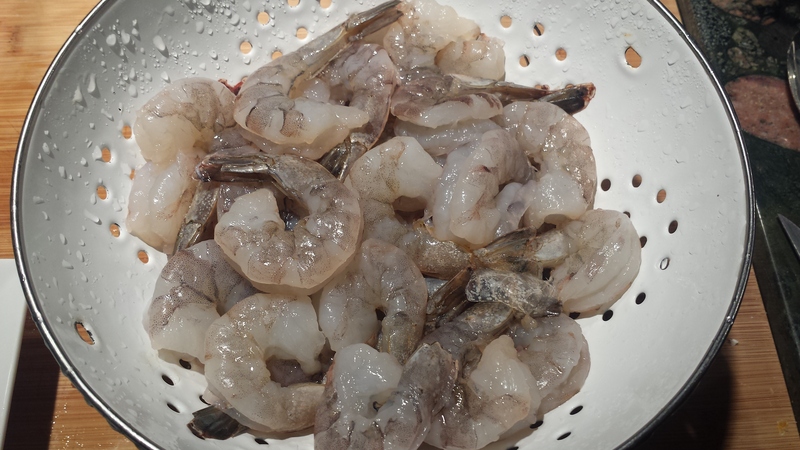 Using a sharp knife, shell and devein shrimp. VIDEO on how to shell and devein shrimp Wash shrimp and dry with papertowels. Slice the bell peppers into strips, discarding seeds and pith. 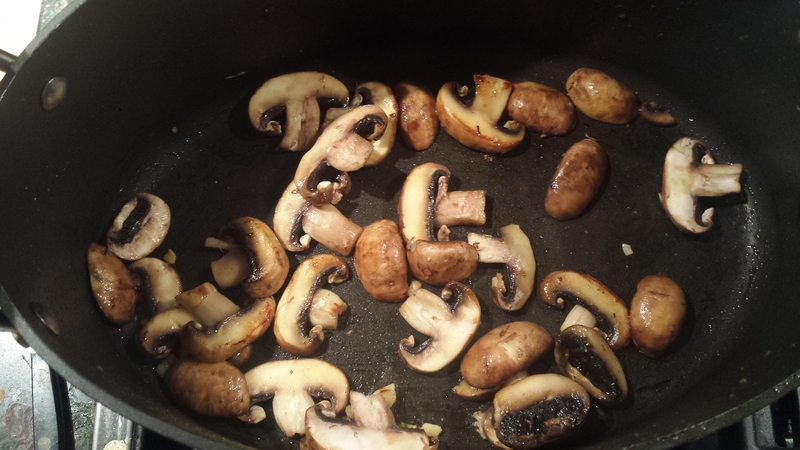 Wipe mushrooms clean with a damp papertowel. Cut off dry end of stem and slice. Heat 1 tbsn of oil in a heavy pan (I love cast iron) on medium heat. 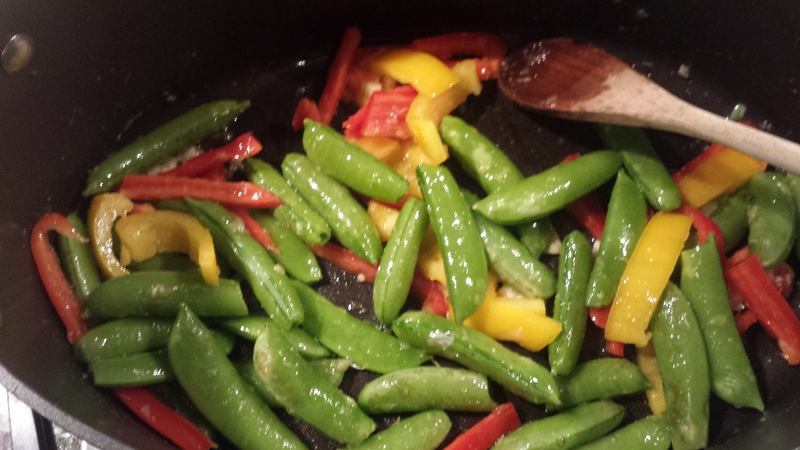 Saute sugar snap peas and peppers (together or separately)for 4 or 5 minutes with half the garlic and ginger. Transfer to a large plate or bowl and leave uncovered (so they don’t continue to cook). Add a bit more oil if necessary and sauté the mushrooms with the rest of the ginger and garlic, 2 or 3 minutes or until slightly browned on the edges. Transfer to plate with vegetables. 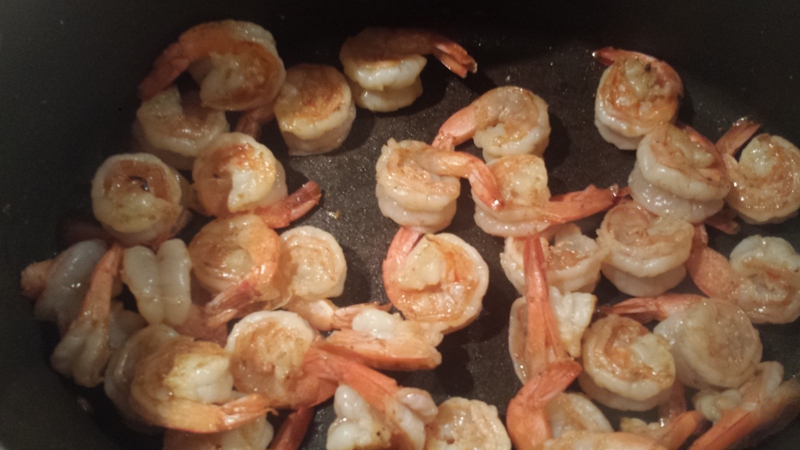 Add a bit more oil if necessary and sauté the shrimp about a minute per side, or until pink and firm. Sprinkle with creole seasoning or just salt and pepper. Add vegetables back into the pan along with any juice made by the veggies and stir until hot. Add salt and papper to taste.